When used with a compatible Brother label printer, the Child Check-In system can be used to print child name badges, parent pick-up badges, room badges and team badges. It is also possible to use the Check-in system without badge-printing, perhaps for a mid-week youth gathering where you simply want to maintain an accurate check-in/out register of attendance. Where speed of processing queues of parents and children is crucial, we recommend using a "wired" printer connected to a Windows check-in device or computer by USB - badge printing is quicker with wired printing. 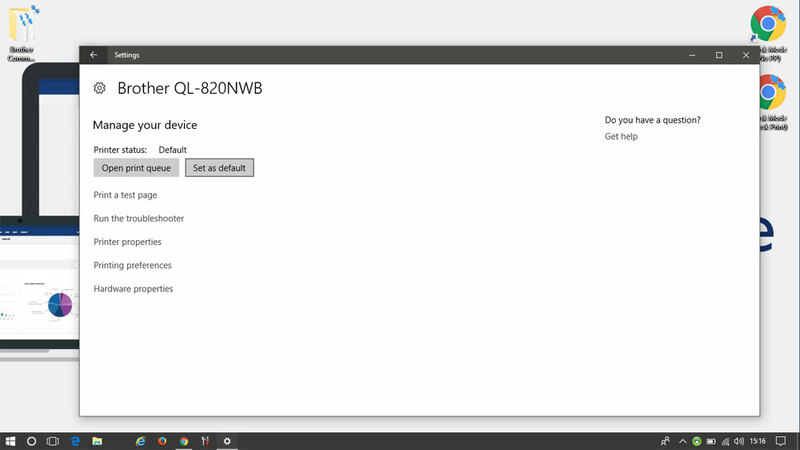 A Windows device running full Chrome works best as Windows Chrome supports the use of kiosk mode and silent printing. Make sure your Windows version is supported by Brother's printer drivers. The system can also be used in a wireless configuration with compatible hardware (check-in device and printer). The device must be either a Windows device running Google Chrome, or an Android device running the ChurchSuite Connect app (available from Play Store). Android: Except for Android devices running the ChurchSuite Connect app, Android devices are not suitable for browser printing due to constraints in Android's native Google Print, which does not support kiosk mode or silent printing. Kindle Fire: The Kindle Fire is not a suitable check-in device. While inexpensive, it doesn't run true Android or support a Chrome browser with silent printing. Chromebook: The Chromebook is not a suitable device as it is not an Android device and runs Chromebook OS, rather than Android OS. Badge printing is therefore not possible. 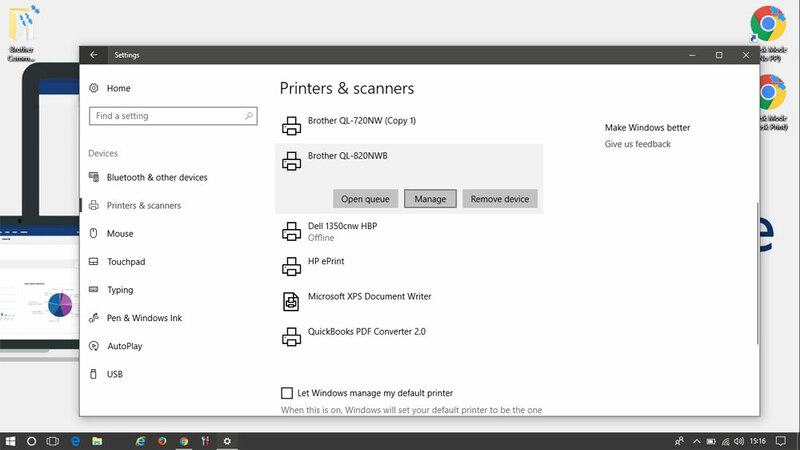 Windows: For Windows devices, makes sure your device's Windows operating system is supported by Brother's printer drivers - for example, devices running Windows Surface are not currently supported by Brother. iOS: The ChurchSuite Connect app is not currently compatible with iOS devices, although an iOS Connect app is expected to be available in the future. Currently iOS devices are not suitable for badge printing from a browser environment due to the constraints of the native Apple Air Print which doesn't support kiosk mode or silent printing. Any device (Android, Windows or iOS) with a browser can however be used for child check-in where badge printing is not required and also for child check-out. The remaining sections then cover the operation of the Check-in system - opening a check-in session and checking children in and out, and the Child Check-in "Admin Area", which will be used by your leaders. Before using the Child Check-In system, you will first need to install and configure the Brother label printer on your computer. ChurchSuite supports the Brother QL-570, QL-710 and QL-720 (no longer available) and the newer QL-700,& QL-800, QL-810W and QL-820NWB models. We also recommend Google Chrome as the preferred browser for running Child Check-in on a computer - Chrome supports silent "kiosk" mode printing so that labels are printed without the usual on-screen print confirmation messages. Other browsers can be used - see our related support article "Silent printing and kiosk mode alternatives for Child Check-in". 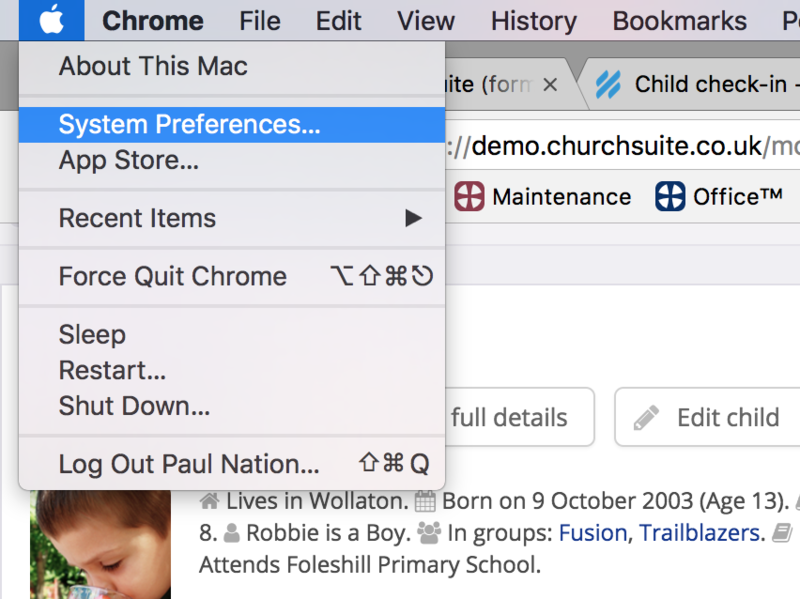 You will also need to configure the Child Check-in settings in the Children module in ChurchSuite and configure 'kiosk' mode in your web browser. Child check-in relies on uninterrupted internet access during a check-in session, as your child attendance data is written back to your Children module from the check-in system in real time. Churches will experience unavoidable connectivity issues if either the connection between the check-in device and printer, or the check-in device and the internet, is lost. We therefore recommend you use a dedicated router with its own private network for your mission-critical processes like Child Check-in and at your Information Desk if you're using Connect. Many churches offer attendees public wifi at their services and events, however this will likely create connectivity issues if that public wifi is handled through the same router or access point that child check-in is using. This can particularly happen during child check-in/out where higher than usual numbers of people congregate in one area to drop off or collect their children, placing additional load on routers or access points in close proximity. Most routers and access points are only capable of handling 30-50 simultaneous connections, with priority given to the newest connections, and the oldest connections disconnected first as the router load balances the connections. This means that while your leaders have success connecting to the internet when they set up the check-in system first thing in the morning when there are hardly any connections, lost connectivity could be experienced as people begin to arrive and connect to your public network. To minimise connectivity issues in environments where you provide guest wifi access, we strongly encourage you to protect your mission-critical IT processes by keeping them on dedicated hardware i.e. a dedicated router/access point located in close proximity to your check-in system, with a private WiFi network and no public/guest connections through that hardware. Tip/Suggestion: Portable MiFi solutions (or tethering to a phone's data service) are inexpensive and may be helpful in your context where 3G/4G signal is good. They may not be suitable for rural settings or where the building blocks or limits mobile data signal strength. These instructions are for Mac users. 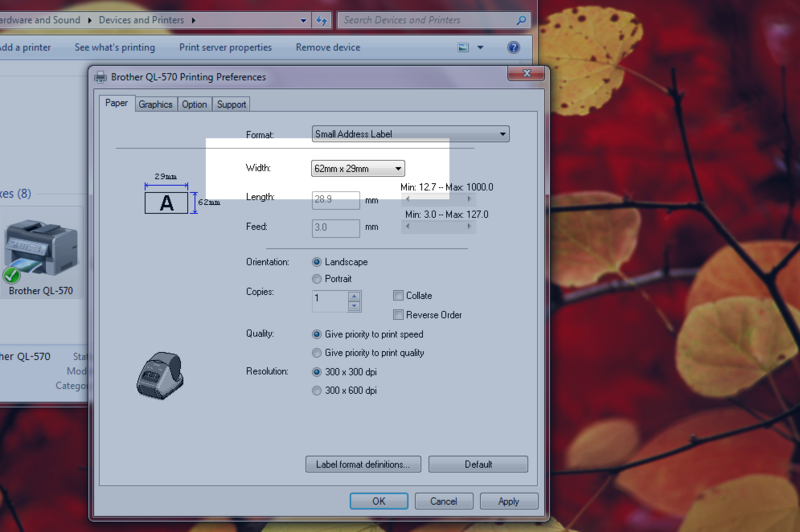 We also have instructions on configuring the Brother QL-700 printer for Windows - see later in this article. While ChurchSuite's admin-facing system can print labels on a wide variety of label stationery, the Child Check-in system requires a specific printer that prints on continuous label stationery - the Brother QL-700. The Brother QL-800, QL-810W and QL-820NWB are also compatible. First, insert the CD that came with the Brother QL-700 printer into your Mac. If you are on a Macbook without a CD/DVD drive, you will need to download the printer installation files from Brother's website. In Finder, navigate to the manufacturer CD/DVD and open it (or the downloaded file), and open the Mac OS X folder. 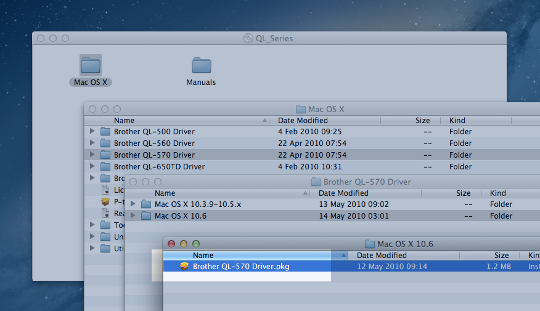 Double-click the folder "Brother QL-700 Driver" (or the QL-800/810/820 folder). Then open the folder that corresponds to your version of Mac OSX. To find out which version of OSX you are running, click the Apple symbol in the top left-hand corner of your screen, and select "About This Mac". The version number can be found underneath the large "OSX" heading. Complete the installation process by following the steps in the installation app. Having installed the device drivers in Step 1, you must now configure the printer - to set the default printer and change the default paper size on the device you are running Child Check-in. 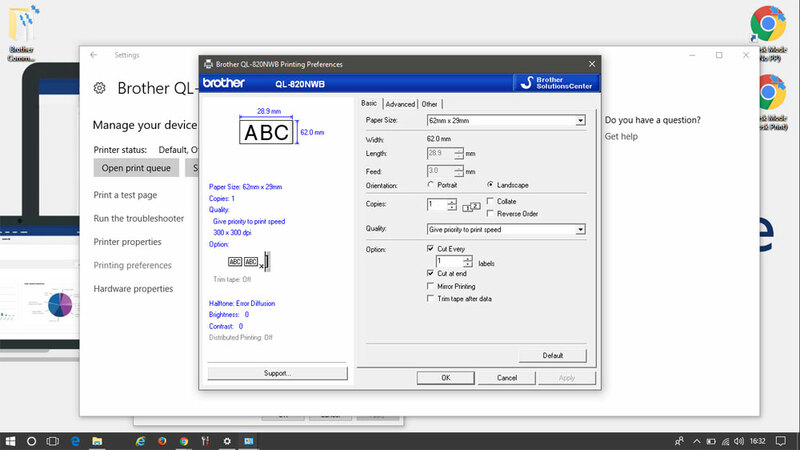 You can only configure the printer for ChurchSuite if it is correctly installed (see above). The following instructions assume you are using Google Chrome. Open Google Chrome and press Cmd+P to bring up the "print" dialog. At the bottom, in the left-hand column, select "Print using system dialog..."
From the drop-down "Paper Size" menu, select "Manage Custom Sizes...". On the next screen, locate the "+" symbol and click to "Add a custom paper size". Your new "custom paper size" will now appear in the list above, called "Unknown". 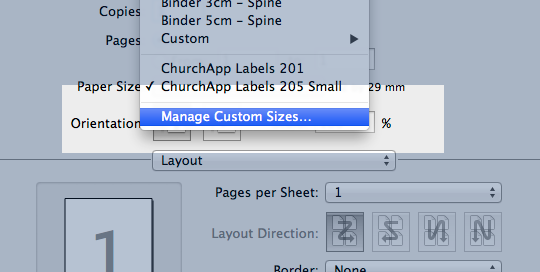 To rename it, double click it and enter "ChurchSuite Labels 205 Small". Press "Enter" to confirm the change on the list. Next, click the "Width" field (next to "Paper Size" at the very top of the Custom Paper Sizes dialog) and enter "62", and enter "29" into the "Height" box (millimeters). Click "OK" to save the changes, or alternatively, click "+" to add a further new custom paper size; perhaps for 'Large" labels - see below. Close the "Custom Paper Sizes" box when you are finished. Please note, the instructions above are for the "205 Small" size label. If you want to use the "205 Large" size label instead, follow the same instructions but set the width to 62mm and the height to 100mm. "205" refers to the Brother continuous label stationery you'll need for your QL printer - part number DK205 (or non-branded equivalent); and is available inexpensively from a number of online resellers. A DK205 continuous label roll is approx. 30.4m (30,400mm) long and will therefore produce 304 x 100mm length large labels, or 1048 x 29mm length small labels, (or 706 x 43mm length Android Connect app check-in labels). In calculating your anticipated costs and stationery needs, remember that labels may be printed for child name badges, parent pick-up badges, room badges and team badges, depending on your configuration, and will all be printed on the same size label - it is not possible to set different size labels for each badge type as the size is governed by the printer driver and not ChurchSuite. By default, Brother printers are preset to sleep and power down after 60 minutes of inactivity. Ordinarily, this isn't an issue, unless your church has multiple weekend services where the printer may switch off in between services and check-in sessions, resulting in possible connectivity issues or queued unprinted labels that cause a bottleneck. This Brother support article explains how to override the default sleep settings and disable the inactivity power down. 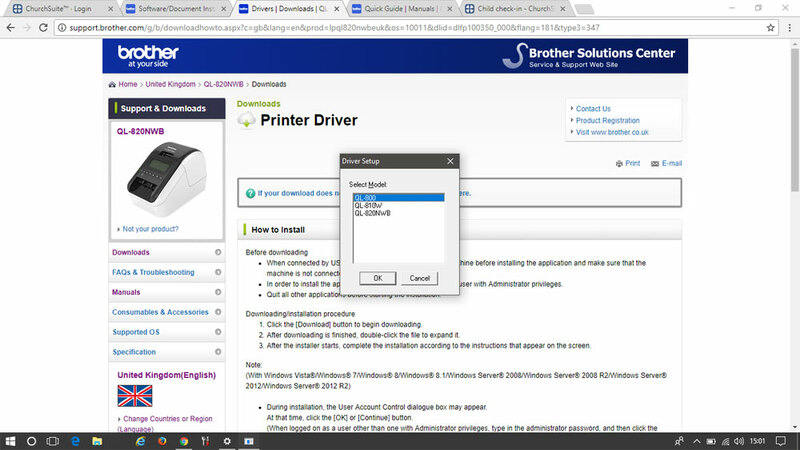 If you experience issues with your computer not communicating with your Brother printer, you may find Brother's Printer Driver Information Cleanup Tool helpful for removing previously installed drivers so that you can perform a clean install. Having set up the custom paper size (label), you will now configure the default printer and assign the default paper size to that printer. Begin by clicking on the "Apple" logo in the top left-hand corner of your computer screen and select "System Preferences". 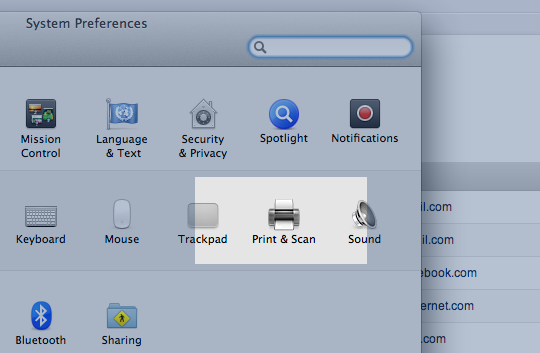 In the System Preferences dialog, select "Print & Scan". Find and click the Brother QL-700 printer in the list of printers (or the 800/810W/820NW). 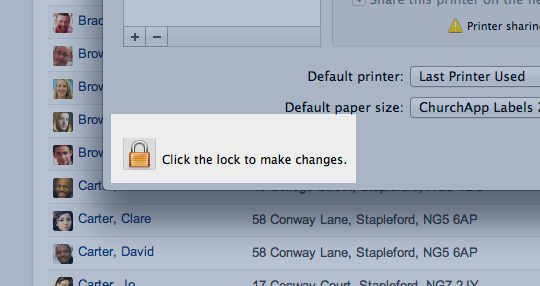 In the bottom left-hand corner of the box, click on the padlock icon that says "Click the lock to make changes" to unlock it - you may be required to enter your computer's administrator password. Next, locate the option that says "Default paper size". From the drop-down list select your newly-created "ChurchSuite Labels 205 Small" (or, if you want the the larger labels, select "ChurchSuite Labels 205 Large"). Confirm also that the default printer is set to your Brother label printer. Finally, click the lock in the bottom left-hand corner again to "lock" the changes you have made. You can now close the System Preferences dialog box. The Brother printer is now ready to be used with the Child Check-in system. Before proceeding, check that you have configured the Child Check-in settings in the Children module options - see later in this article. These instructions are for Windows users. 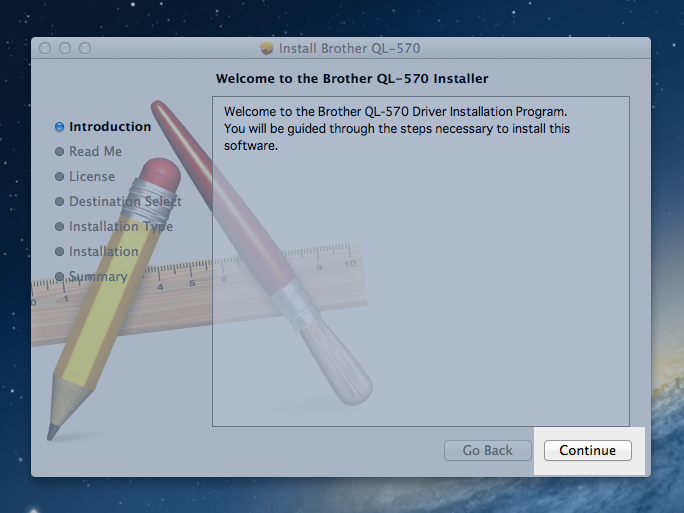 We also have instructions on configuring the Brother QL-700 printer for Mac - see earlier in this article. 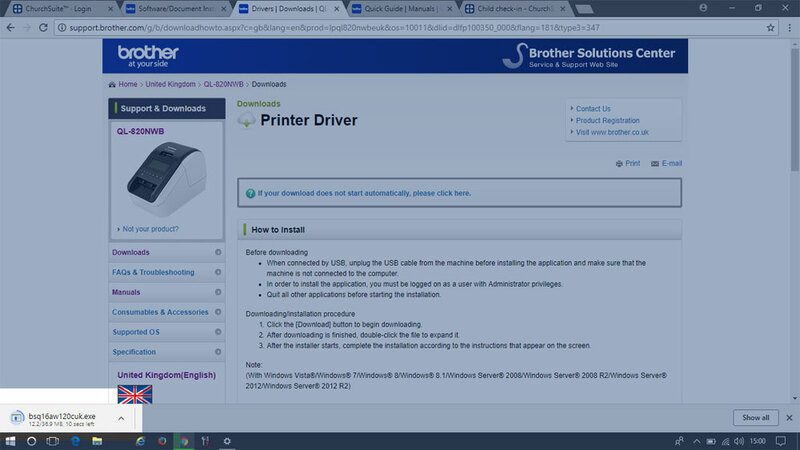 First, you will first need to download to printer installation files from Brother's website. Begin by selecting the model of label printer that your wish to install the drivers for. 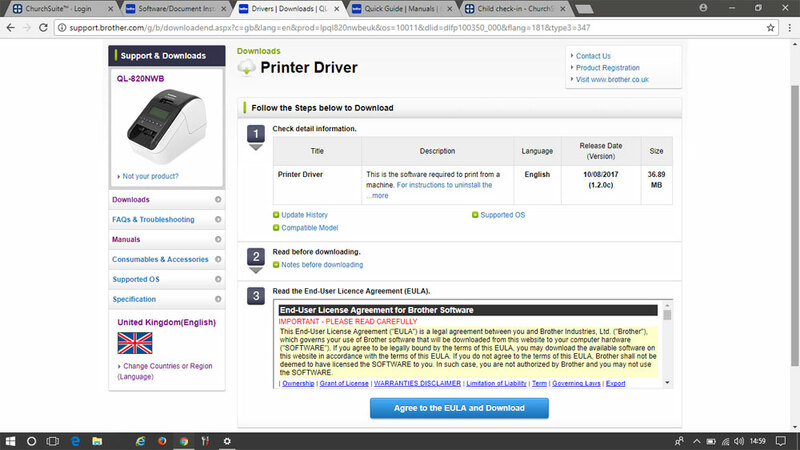 Click "Agree to the EULA and Download" to download the drivers for your select model of label printer. Click on the downloaded file to open it and begin the installation process. When asked, accept the licence agreement and follow the on-screen instructions. When prompted, select the printer model you wish to install - either QL-700, QL-800, QL-810W or QL820NWB and click "OK". Having installed the printer software, you must now configure the printer and set the default printer and change the default paper size on the device you are running Child Check-in. You can only configure the printer for ChurchSuite if it is correctly installed (see above). The following instructions assume you are using Google Chrome. 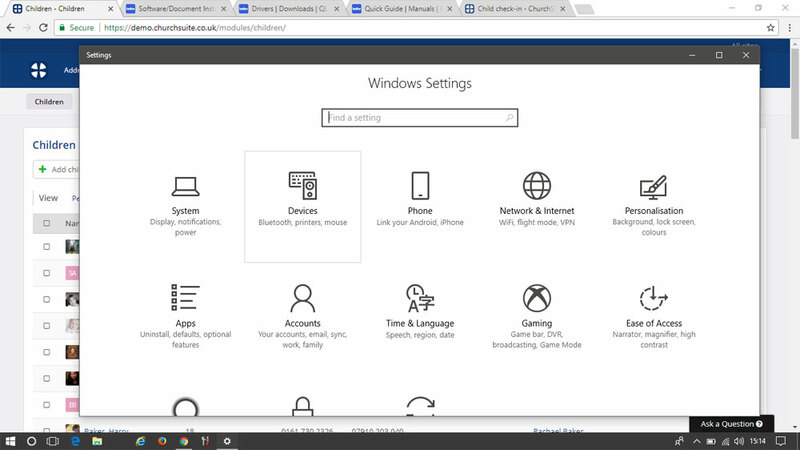 Working on the computer you intend to run Child Check-in, click on the Windows "Start" menu and select "Settings" icon. Click into the "Devices" section. 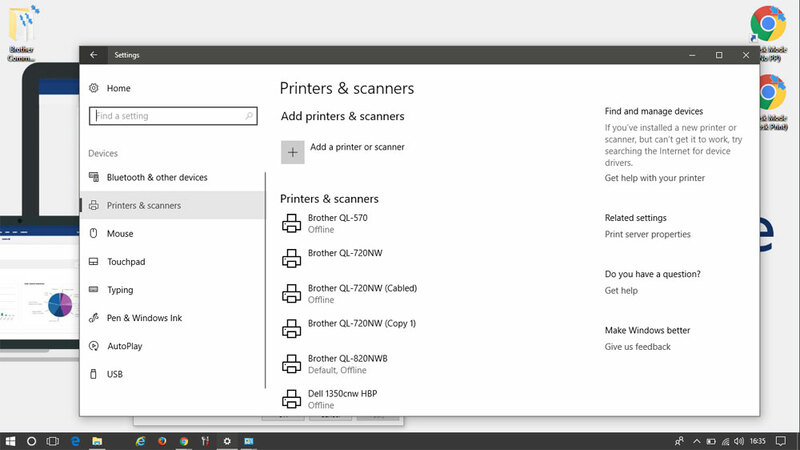 Click into the "Printers & scanners" section in the "Devices" menu. 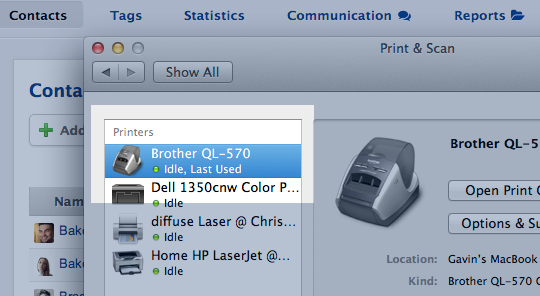 Click on the entry for your Brother printer, followed by the "Manage" button. Click the "Set as default" option. Next, click on "Printing Preferences" and in the pop-up window that opens, use the "Paper Size" drop-down menu to select the default paper. Select either the "62mm x 29mm" or "100mm x 62mm" options, depending on whether you are planning to print out the check-in badges for your children's groups in either our "ChurchSuite Labels 205 Small" (62mm x 29mm) or "ChurchSuite Labels 205 Large" (100mm x 62mm) formats, then click "OK". Please note that these instructions are for the Small label badge size. If you prefer to use the Large labels, select "Large Address Label" and set "Width" to "100mm x 62mm". The Brother label stationery required is part number "DK205" (or equivalent), and is available inexpensively from a number of online resellers. A DK205 continuous label roll is approx. 30.4m (30,400mm) long. Typically a single roll will produce 304 x 100mm length large labels, or 1048 x 29mm length small labels, (or 706 x 43mm length Android Connect app check-in labels). In calculating your anticipated costs and stationery needs, remember that labels may be printed for child name badges, parent pick-up badges, room badges and team badges, depending on your configuration, and will all be printed on the same size label - it is not possible to set different size labels for each badge type as the size is governed by the printer driver and not ChurchSuite. Having selected "Small Address Label", check that the "Width" now shows "62mm x 29mm". Click "Apply" and "OK" to save your changes. The Brother printer is now ready to be used with the Child Check-in system. Having installed the printer software and configured the printer driver defaults, you can now proceed with configuring the Child Check-in settings in ChurchSuite (see next section). Having configured the Brother printer and set the default printer and printing preferences (see previous sections), there are a number of helpful Child Check-in settings within ChurchSuite that will enable you to customise the system to suit your needs and the experience of leader/parents/visitors when they use check children in or out. In ChurchSuite, and beginning in the Children module, click the module settings - the cog-wheels in the top right-hand corner of the page - you'll need Manage module or Administrator permissions to access this. Select the "Connect" tab - this has all the settings related to Child Check-In. We'll work through each of the settings in turn. Choose the default Gathering that Check-in will use - probably your Sunday services Gathering - although you can override and select a different Gathering when you open a Check-In session (see later in this article for "Starting a check-in session on a Sunday"). Specify the "ticket size" for the printed badges - this will be either the small or large labels size that you previously configured as the default in the printer settings. 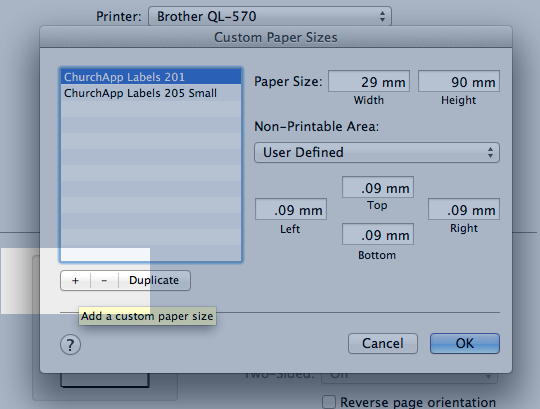 It's important that the label size selected here in ChurchSuite match those set for your printer. Again, you will be able to override this and select a different label size when you start the Check-In session, if you need to (however, you must change the printer defaults if you do this). Next, set whether the "check-in code" will be auto-generated by ChurchSuite, or whether a check-in code will be manually entered by your leaders when a child is checked in - for example if you are using pre-numbered wrist bands, you can manually enter the number of the band you give to the parent. Remember, the check-in code is what you will likely use in order to match against the child when handing a child back to the correct parent at the end of the Session. Selecting 'Auto-generated by ChurchSuite' will create a unique 'pick-up' code that will be shown on both the parent pick-up badge and all child badges printed for that family. A unique code is generated for each family's children and it is unique to the date and Gathering children are being checked in to - it's therefore not possible to use an old or discarded pick-up badge in future Sessions! Both "auto-generated" and "manually entered" pick-up codes are recorded with the attendance data that gets automatically added back in the Children module >Attendance, so you'll always have a record of check-in codes and date/time stamps. You can also set the default Process setting, selecting between one-stage "Register & Check-In", or two-stage "Register first, Check-In later". A detailed explanation of the difference between these two options is provided later in this support article. Continuing through the settings. Next, add an optional custom 'welcome message' to be displayed on the Child Check-in screen to greet parents - this might, for example, include simple instructions for parents/visitors. Next, set any Child Check-in 'Search Field' restrictions. By default, you can search for a child by first name, last name, the full or last 4 digits from a telephone or mobile/cell number, or by scanning the family's barcode. For churches with unstaffed Child Check-in kiosks, you may choose to further safeguard children's identities by restricting the check-in search fields (see image below), perhaps disabling "name search". For example, by disabling "Name" search, individuals are prevented from random searches like "John", which would otherwise display a list of all the children with "John" in their name. On the other hand, particularly with a staffed Child Check-in kiosk, or for large numbers of children, having a broader range of "search field" options will make it easier and quicker for parents/visitors to locate and check in their children. In the "Search Fields" section, select to enable/disable each of the 'search field' options as appropriate. 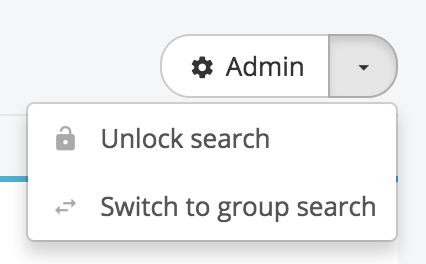 During Child Check-in, your leaders can use an 'Unlock search' option (on the drop-down arrow button shown below) to search against all fields, should a parent not be able to find their child using a more restricted search. The Child Check-in system PIN will be required if one has been set (to set this, see later in this article). The search method will automatically lock back down after performing an unlocked search. The search method can also be locked down at any time by selecting "Lock search" if it is no longer required. 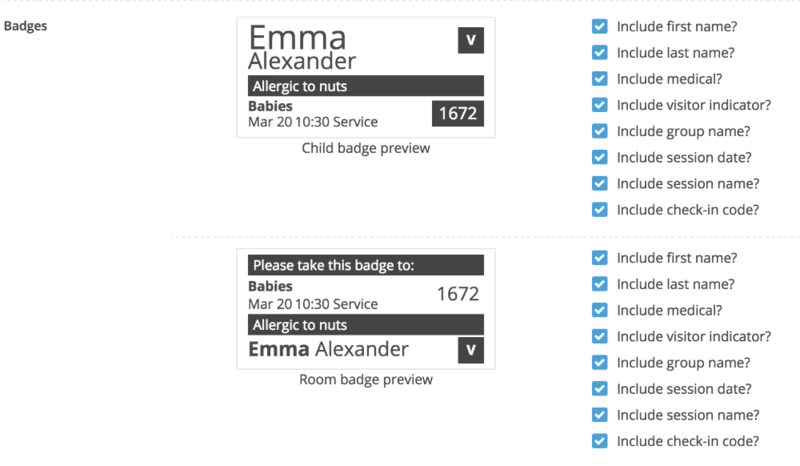 The next section of settings relate to customising the child and room badges. A visual example of each badge is shown. As you check and uncheck the various options, the example badges are updated so that you can see what a printed badge will look like. Note that it is not possible to customise the Parent 'pick-up' or Team badges. The next settings relate to Visitors. Using these settings you can set which fields of information are requested from visitors when they check a child in using the Child Check-in system. You can also set which fields are 'required'. You might, for example, find it helpful to make certain fields 'required' so that you can always contact the parent in an emergency during a Session, or to follow up with visiting families after the session as part of your newcomer welcome processes (see also the related support article "Managing the details of your child check-in visitors"). For Data Protection reasons, children visitors are not automatically added to your Children module contacts. 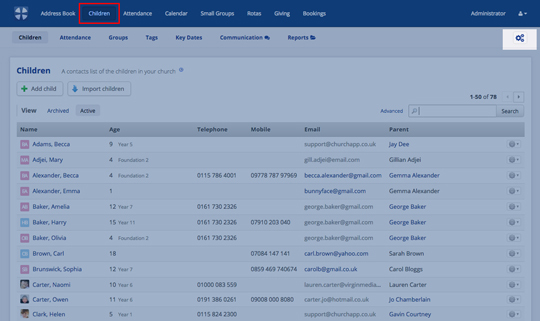 Instead, a separate log of their attendance is maintained in the Visitors report in the Children module in ChurchSuite. Visitors are deleted automatically if they have not checked in for a certain period of time. Using the "Delete visitors after" setting (see image above) you can set how long child visitor details are retained on the system before being deleted. Continuing down through the Check-In settings, the next section is called "Custom Fields". For each of the Custom Fields that exist in your Children module, you can set whether those fields are visible in the Child Check-In system's "Admin Area". This might be useful if you have particular 'check-in related' custom fields that you would like visible to your leaders when they are in the Child Check-In Admin Area. Simply check (or uncheck) each Custom Field that you wish to set as visible. Next, add an optional 'Success Message' that is displayed on the screen after a parent clicks 'Check-in' or 'Register', while the badges are being printed. This might, for example, be instructions on how parents/visitors should collect their children at the end of the Session. The final setting relate to the Check-in "Admin Area", which we recommend should only be made accessible to your leaders. The Admin Area is where leaders can overview the active Child Check-in session, to see which children are registered/checked in. They can also view parent contact details, important medical notes, special needs, custom fields and photo/video consents for children, and much more (see later in this article for a full overview). The Admin Area is also the place your leaders will go to check out children at the end of the Session. You can set a PIN to restrict access to the Admin Area and only make this known to those leaders who need to know. Once set, the PIN will be required in order to access the Admin Area and view the check-in register and other child/visitor/group check-in information for that session, and also to unlock child search restrictions (see earlier). 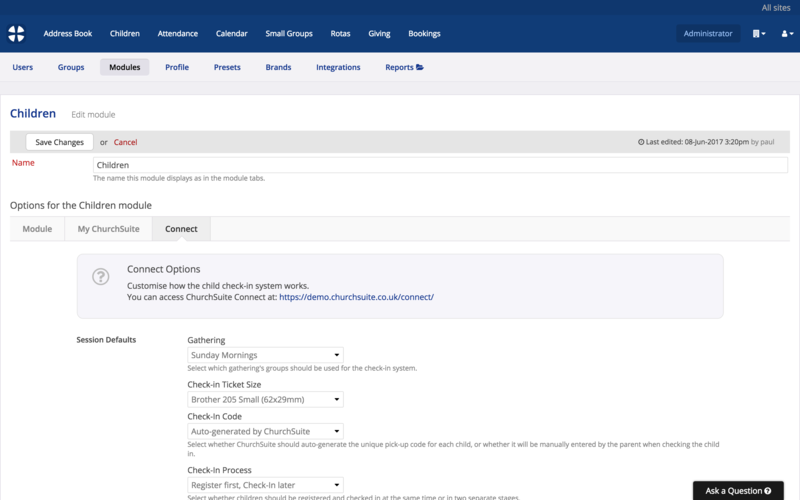 Having reviewed/updated the Connect (Child Check-in) settings in ChurchSuite, save your changes before navigating away from the page. Having installed the printer software (see above), set the printer driver defaults (see above) and configured the Child Check-in options in ChurchSuite, you can now optionally configure your web browser for 'kiosk mode' and 'silent printing' - see next section. "Kiosk mode" means that the Child Check-in system operates in full screen mode (to prevent unauthorised access to other areas of the computer) and with "silent printing" (skipping the usual print prompts or user-confirmation questions) to simply print badges without interruption or intervention. We recommend using Kiosk mode on all computers/laptops being used for Child Check-in. This is most easily achieved using Google Chrome on a Windows device. Not using Chrome on Windows? We have created a related support article that outlines some of the 'kiosk mode' alternatives if you're not running Child Check-in in Chrome on a Windows device. 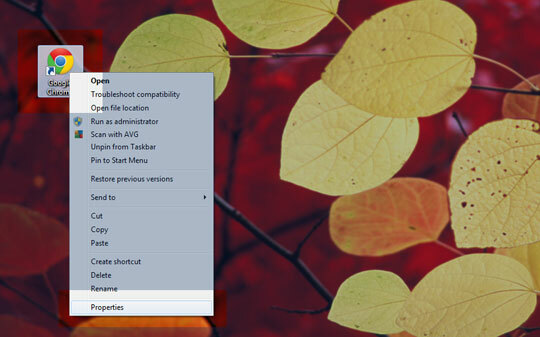 From the Windows "start menu" (or Start Page in Windows 8), search for your "Chrome" application. 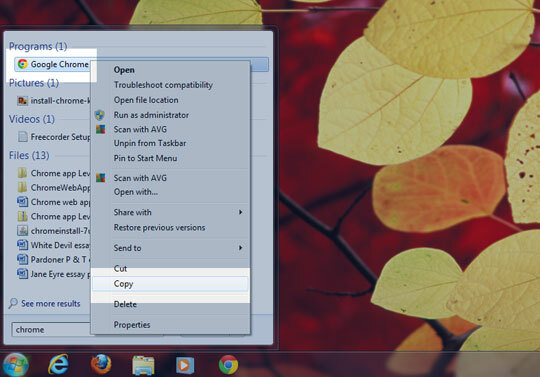 You can also search for it using Windows Explorer, if you wish. 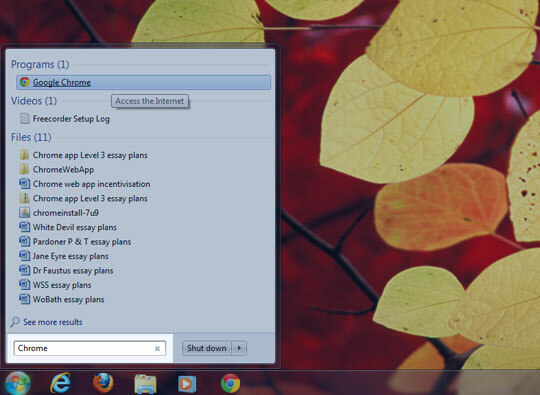 You will see Google Chrome appear at the top of the "Start" menu. Right-click on it and select "Copy". Now, clicking on a blank area on your desktop, right-click and select "Paste shortcut". This will become the shortcut link that you will use for launching Child Check-in in the future. Right-click on your newly created Chrome shortcut and select "Properties". Select the "Shortcut" tab and the "Target" field. ...where account refers to the first part of the web address of your church's ChurchSuite account. For example, if you access ChurchSuite using the URL kingshope.churchsuite.co.uk, your account would be kingshope . Note all the spaces in the above Target link - they're important! Click "OK" to save the properties for your shortcut. Now, ensure Google Chrome is not already running on your computer (you should use Task Manager to close any running instances of Chrome, especially in Windows 10 where Chrome services continue to run event after closing the application). You can now open a new instance of Google Chrome in Kiosk mode using the new shortcut link on your desktop. Note: To exit Kiosk mode, press ALT+F4. 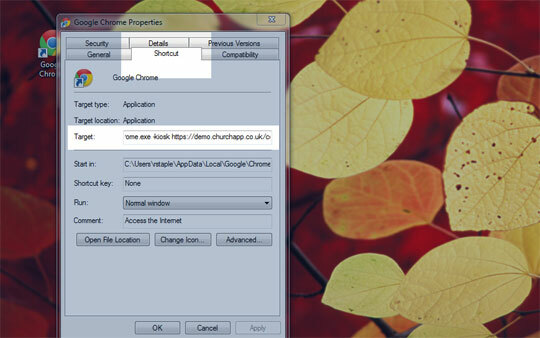 Please remember this, as this is the only way to close Google Chrome when you are in Kiosk mode!